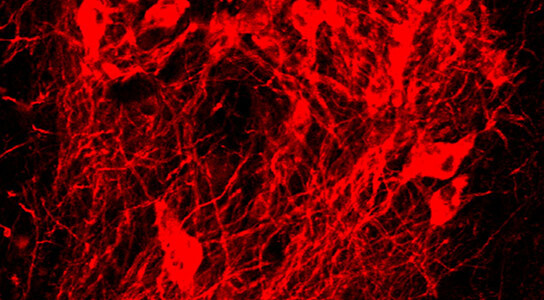 Ole Isacson and colleagues reported that dopamine-producing neurons (pictured) derived from the skin cells of primates survived for more than two years after implantation into one of the animals. Isacson noted that the animal was “able to move as fast around its home cage” as an one without Parkinson’s, and had normal agility, though individual motions were still slowed by the disease. By using induced pluripotent stem cells, researchers have markedly reduced the symptoms Parkinson’s disease in primates. Harvard Stem Cell Institute (HSCI) researchers at University-affiliated McLean Hospital have taken what they describe as an important step toward using the implantation of stem cell-generated neurons as a treatment for Parkinson’s disease. Ole Isacson and colleagues reported that dopamine-producing neurons derived from the skin cells of primates survived for more than two years after implantation into one of the animals, and markedly reduced its Parkinson’s symptoms. The primate did not require immunosuppression, the scientists reported in the journal Cell Stem Cell. Penelope J. Hallett, an assistant professor of psychiatry at Harvard Medical School (HMS) who works at McLean with Isacson, is the first author on the paper. Such positive results were only seen in one animal because the experimental protocols evolved and were improved over time. Originally, the experiments were conducted using neurons derived from embryonic stem cells, which required using immunosuppressive drugs in the animals, and did not produce results that were as positive. The current experiments used induced pluripotent stem cells, or iPS cells, which use a patient’s own skin cells to create the stem cells and then the neurons, so the patient — or in this case, the primate — does not recognize the new dopamine-producing neurons as foreign and reject them. “It’s very difficult to get cell survival in primates,” said Isacson, who has been refining his experiments for more than 15 years. “This is a very high bar to clear.” Isacson is an HSCI principal faculty member, an HMS professor of neurology, and director of the Center for Neuroregeneration Research/ Neuroregeneration Laboratories at McLean. Isacson said the conclusion of this experiment marks “the first time that an animal has recovered to the same activity level he had before.” He noted that the animal was “able to move as fast around its home cage” as an animal without Parkinson’s, and had normal agility, though individual motions were still slowed by the disease. In this latest experiment, the neurons were implanted into only one side of the animals’ brains, and the improvements were seen on the opposite side, as would be expected. Parkinson’s, which may affect as many as 1 million Americans, is caused by a depletion of dopamine-producing neurons in the brain. The disease causes a range of symptoms, from mild tremors to dementia and death, and can include slowed movements, muscle rigidity, tremors, changes in speech, loss of autonomic movement, and related issues. Current treatments include medications, electrical implants in the brain, and, in a limited number of cases, fetal neuron transplants. “Conservatively, I’d say we’re three years” from requesting the go-ahead from the U.S. Food and Drug Administration for a Phase 1 clinical trial, Isacson said. “Our next year will be dedicated to making cells” free of contaminants, creating a matrix on which to grow cells that “is free of any animal proteins,” and establishing a cell-freezing protocol, which will be necessary for transporting and storing the cells. Additionally, he said, the researchers need to perfect cell-sorting technology. The current experiments were funded by HSCI and the Harvard Miller Consortium. Be the first to comment on "Possible Signs of Progress in the Fight Against Parkinson’s"